It's time for some cuttin' and some struttin'! Edward Leslie is the Rachel Dratch to Hulk Hogan's Tina Fey - they were friends before one hit it big, and the successful one tried to carry their overlooked buddy along with them. When Hogan was "Terry Boulder," he was paired with his kayfabe brother "Ed Boulder"; when he was "Hulk Hogan," Ed was "Dizzy Hogan." 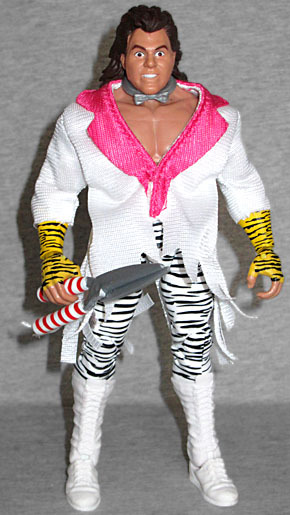 In 1984, he was introduced to the WWF (in a vignette that saw him dancing to Patty Smyth's "Warrior") as a male stripper - thus the "Beefcake" name. He didn't get dubbed "The Barber" until 1987, when he helped Roddy Piper win a "hair vs. hair" match at WrestleMania III. Wrestling is weird. Although he has a reputation for riding Hogan's coattails and has had more gimmicks than Hank Pym, Brutus wasn't really a terrible wrestler - there are definitely guys who have had worse skills and become bigger stars. He was the one who broke Mr. Perfect's winning streak, after all. And by 1989 he'd spent a long time working the midcard with Million Dollar Man, Rick Martel and Randy Savage, and there's no way to spend all that time working with those guys and not become better. The toy has a wonderfully manic look on its face, with wide eyes, arched eyebrows, and the mouth open to show some teeth. It's not the smug expression shown on the back of the packaging, nor the indifferent look a lot of toys have, but it totally works for him. The package says this look comes from November 1989, so he's sporting a massive mane of hair, too. 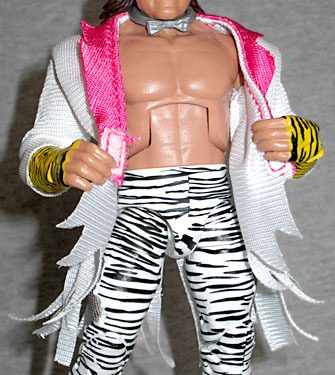 The expression, like the ring attire, seems to be taken from a specific promo shot from back in the day - he's wearing zebra-print tights, similarly striped yellow gloves, a silver bowtie (a holdover from his days as a pseudo-Chippendales dancer) and a white jacket with tattered edges and pink lapels. To be completely accurate, the jacket should also have pink stripes and some cutouts revealing mesh beneath, but that would have been way too hard to do at this scale and this pricepoint. Bonus points for sculpting the mesh in the rips on his tights, though! That makes it clear these legs are totally his, not reused from someone else. You can take the jacket and tie off when it's time for him to grapple, but while he's just as nicely articulated as the other Elite Collection figures - having hinged rocker ankles, swivel shins, double-hinged knees, swivel thighs, balljointed hips, a swivel waist, hinged torso, swivel/hinge wrists, double-hinged elbows, swivel biceps, swivel/hinge shoulders, and a balljointed head - but it's certainly not enough to get him into his patented finisher, the sleeper hold. 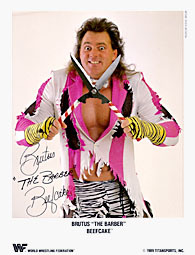 Before becoming The Barber he'd used a different finisher, but since the sleeper hold was a staple of both Roddy Piper and Adrian Adonis (the two men involved in the hair match that gave him his gimmick), it became his, as well. You can almost get his arms into the right position, but you'd be hard pressed to find a figure thin enough to fit in there. Brother Bruti has an accessory, and it's the one that he has to have. See, since he was trading on the barber gimmick, many of his matches ended up with him giving his unconscious opponent an unceremonious haircut. (The reason so many jobbers were willing to lose to him, by the way? They got an extra $300 on top of their regular pay, and there was a professional stylist waiting backstage to fix them up after.) Since carrying around a little pair of scissors wouldn't play to the people in the cheap seats, he needed something more visible - he needed something more theatrical. So he carried a pair of garden shears with the handles taped to resemble a striped barber pole. The accessory has a pivot in the center, so it can open and close just like the real things, and his hands are open to hold the handles. Starting in Elite Series 47, the figures each began coming with a segment of an exclusive diorama - buy the entire series, put the cardboard slips in the included plastic stands, and you've got a fancy little backdrop for your figures. Series 49, of which Beef is part, builds the "crowd" diorama, basically a shot of the ring from the entrance ramp. Since Brutus is figures #5 of 6, his piece is a bit off to the side, and therefore doesn't really look like anything specific at all. Just impressionist blobs. Brutus "The Barber" Beefcake may have been riding Hulk Hogan's coattails, but as much as people try to pretend it now, that wasn't general knowledge at the time - the smarts may have known it, but the marks didn't. And he may have been a mediocre wrestler, but he was still probably one of the top five most popular guys in the company, which was all on him and his personal charisma. He was so popular, he was booked to take the Intercontinental Championship off Mr. Perfect at SummerSlam in 1990! But then real life intervened. While parasailing with friends, a miscommunication between Brutus, the woman who was about to go up, and the man driving the boat led to him getting his face kicked in. That's not an exaggeration or just a turn of phrase, by the way: the woman didn't have enough lift to clear Brutus, who was standing on the beach between her and the boat; she tried to pull her legs up to avoid him, but ended up slamming him square in the face with her knees, shattering his bones. He underwent an eight-hour reconstructive surgery in which his face was peeled back and his skull was reassembled with eight titanium plates, dozens of screws, and over 100 staples. It was Hogan who convinced the WWF not to let him go, trusting that his friend would recover and be able to wrestle again. He did and he was, but all the momentum he'd had was lost, and Creative wasn't interested in building him up again. His most noteable moment after the accident was probably hosting the segment where Shawn Michaels superkicked Marty Jannetty to begin his singles career. 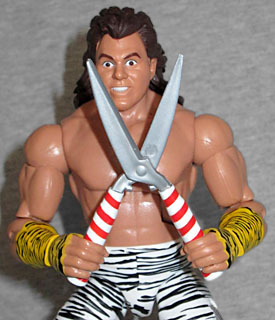 He's very much a "what might have been" wrestler, but The Barber is also a true classic, and Mattel did their usual great job on him.